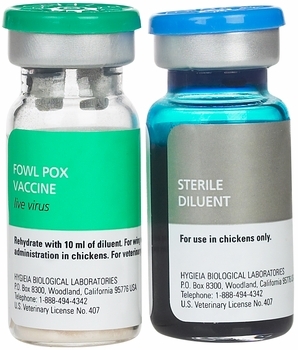 Fowl Pox Vaccine 1000 dose for birds 8 weeks or older. Fowl Pox Vaccine is a chicken embryo propagated, freeze-dried, live virus vaccine for wing web administration in chickens. The vaccine is recommended for vaccination of healthy chickens aged 8 weeks or older but at least 4 weeks prior to start of lay. When used as indicated, it will aid in preventing the clinical signs caused by the virulent field strains of fowl pox virus. Tear off the aluminum seal from the vial containing the freeze dried virus. Lift off the rubber stopper. Remove the seal and stopper from the diluent bottle. Each diluent bottle contains 10 ml of diluent. Pour half of the diluent into the vial containing the freeze dried virus. Replace the rubber stopper and shake the vaccine vial. Pour the partly dissolved vaccine into the diluent bottle to the mix the rest with the diluent. Replace the rubber stopper and shake vigorously until the vaccine is dissolved completely. The vaccine is now ready for the administration by the wing-web method. For administering the vaccine, hold the bird and the spread the underside of one wing outward. Insert the double needle applicator into the vaccine bottle, wetting or charging both needles. Pierced the web of the exposed wing with the double needle applicator charged with the vaccine. Insert the double needle applicator into the vaccine vial again and proceed to vaccinate the next bird. During vaccination avoid hitting large blood vessels, bones and the wing muscles with the double needle applicator. Do not inject in any other site except exposed wing web. Examine the site of vaccine administration for "take" at 6-8 days post-vaccination. A positive take showing that the vaccination was successful, is indicated by swelling or formation of a nodular lesion or scab at the site of inoculation. Swelling and scabs will disappear at about 2 weeks following vaccination. The absence of take may indicate that the birds were immune before vaccination or that improper vaccination methods were used. Do not spill or splatter the vaccine. Burn containers, unused vaccine and accessories prior to disposal. Do not over dilute the vaccine or otherwise extend the dosage. Store unopened vials at not over 45 degrees F or 7 degrees C. Do not vaccinate within 21 days of slaughter or 4 weeks prior to start of lay. The vaccinated chickens should not be placed on contaminated premises. All susceptible chickens on the same premises should be vaccinated at the same time. If this is not possible, then strict isolation and separate caretakers should be employed for non-vaccinated chickens. Efforts should be made to reduce stress conditions at the time of vaccine administration.